Bognor is one of the oldest recorded anglo-saxon names in Sussex and was recorded in 680 AD as Bucgan Ora (meaning: Bucge's shore or landing place). For centuries it was a small fishing town which, like many other south coast towns also had a reputation for smuggling. In the 18th century Bognor became an attractive home for wealthy Georgians, who came in small numbers and built large houses. One of these wealthy people was Sir Richard Hotham who purchased 1,600 acres of land and began developing Bognor, which was essentially a tiny hamlet, into a town. This included the building of his mansion 'Chapel House' which later became 'Bersted Lodge' then 'Aldwick Manor' and then 'Hotham Lodge'. It is now known as 'Hotham Park House' and has been developed into luxury flats. In 1929, King George V was ill and was advised to spend some time by the sea. He resided for some time in the hamlet of Aldwick, just to the West of Bognor. This lead to Bognor attaining the royal suffix 'Regis'. The 22 acre grounds of Hotham Park House were landscaped with the assistance of Kew Gardens, which included the planting many trees, shrubs and exotic plants, during the early 20th century. After the second world war, the grounds of the house were purchased by Arun District Council and turned into a public park. 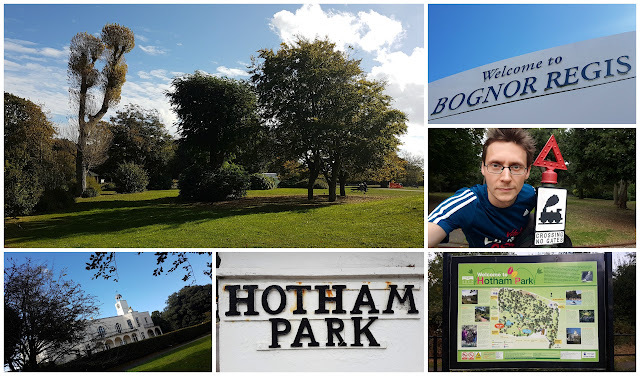 As of 24 May 2014 , 'Hotham Park' became the home of Bognor Regis parkrun. We visited this venue on 15 October 2016 to run at event number 123. We made our way down to Bognor Regis on the morning of the event and parked in the small car park in the north-east corner of the park. At the time of our visit, the parking charges were 60p for an hour, £1.20 for up to 2 hours, or £2.40 for over 2 hours (we paid the full amount and stayed all day). The parking charges vary depending on time of year [summer/winter] so please check the council's webpage for up to date information. As the car park is pretty small it's worth noting that there is another car park, the London Road Car Park - this is adjacent to the west side of the park - it's a little more expensive, but has more spaces. Bicycle users should head straight to the meeting point of the run where there are some racks and fences to secure their bikes to. The nearest train station is Bognor Regis station and it's just a short walk to the park from here. Toilet facilities are well covered - there is one block next to 'Hotham Park House', there's a second set over in the London Road car park, and lastly there are more toilets in the cafe. Although I'd imagine that these should only be used post-run by customers. It's also worth noting that if you are planning to stay at Butlins, it is right across the road so is perfectly placed for a quick Saturday morning run. The park itself is lovely. It is quite compact and features a network of meandering paths. It looks as if most of the landscaping has been retained - in a way it's more like a big garden. There are no significant open grass areas to be found and no sports facilities. It does, however, have a miniature railway, two children's playgrounds, a boating lake (pond), a bandstand, a putting green, and a few conservation areas. The meeting point for the run is on the path next to the boating lake, which is also in the shadow of the Hotham Park House clock tower, which was part of the original chapel that was demolished during the 19th century. The run itself takes place over four, clockwise laps of the park, with the first lap being slightly different to the following three. Underfoot is all tarmac so road shoes are the order of the day come rain or shine. The entire route is flat and very twisty - the full lap of the park contains eighteen bends and I'd say six of these are tight enough to cause a reduction in pace. As mentioned above, the first lap is a little shorter than the rest and comes in at about 700 metres in length while the main loop (run three times) is just over 1.4km, this main lap also features a short section that is run along an alleyway just outside the western border of the park. It's worth noting that the final section of each lap is also an access road for residents of the flats in Hotham Park House, so there is the possibility of interaction with a vehicle. The course also passes over the train track a couple of times on each lap, but as the train doesn't start running until late morning, there's no risk of a clash. With this course being four laps, it's not long before the front runners catch up with the back of the pack so wherever you are in the field you will find that you will lap someone, be lapped or even both. The other thing to note is that the paths are mostly quite narrow so filtering through can be a little tricky as the laps progress, especially as this venue attracts almost 200 participants every week. Once I had finished my run and had my barcode scanned (unusually, this happened in the finish funnel itself), I went off for a cool down and to thank/chat to some of the marshals I had spotted around the course. One of them, Derek, has his own permanent marshaling spot and as we chatted, I noticed that all of the runners seemed to know him by name and thanked him as they passed or left to go home. As we had had a pretty long drive, we decided that some refreshments were in order so we popped into the Hotham Park Cafe for breakfast and a coffee. The building has only recently been built (opened in July 2015) and it offers a lovely spot to relax after a the run. We followed this up with a ride on the 12 1/4 inch miniature railway - we sat in the carriage named 'Pickle' and were taken around by the engine 'Boris' - he got his name from the words 'BOgnor RegIS'. The results were online a couple of hours later and there were 185 participants at event 123. 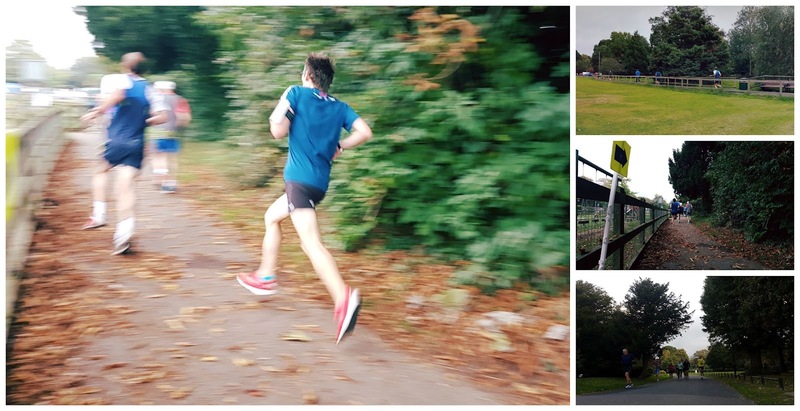 I had recorded my run using Strava and if you would like to see the course in more detail, feel free to have a look at my data: Bognor Regis parkrun. After spending a a few hours down at the seafront (only five minutes from the park), we decided to head home. We'd had a great day out at Bognor Regis so were pleased that we'd made the effort to get up and out so early in the morning to travel down. As for the parkrun, if you like twisty courses around pretty parks you simply have to get down here! 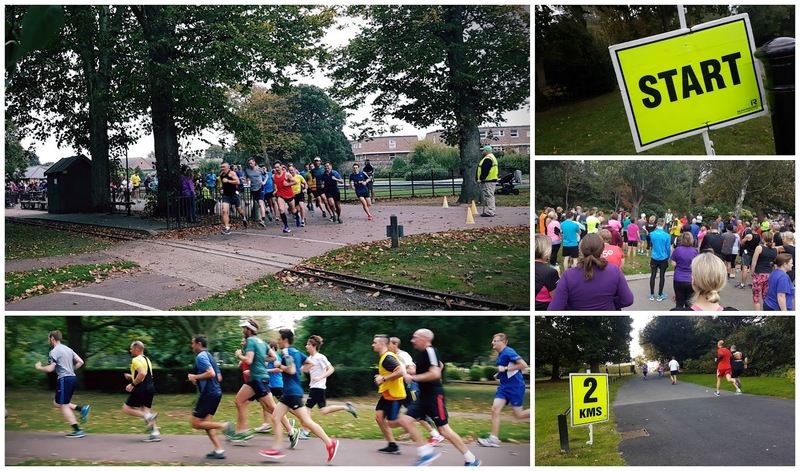 Edit / note: If Hotham Park is not available, the run has, in the past, taken place at King George V Playing Field, Felpham, which is used as a back-up venue. Make sure you check the news/social media pages before leaving home just to be sure.